Having set sail to online casinos earlier this week, fans have been ecstatic with Elk studio’s new release, Wild Seas. Elk Studios is not the most prolific of development studios but when they drop a new title it is well worth sitting up and paying attention. Wild Seas is a pokie that brings you into the world of high seas piracy. When you aren’t landing winning combinations on the reels you need to look out for other captains who want to see your ship at the bottom of the ocean. 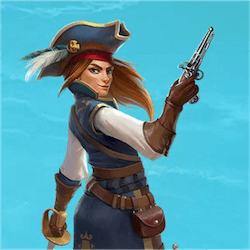 Elk have included all this high seas drama in the unique bonus game on offer here which sees you attacking the convoys of these rival captains and collecting the loot they drop. Even if you aren’t the world’s biggest pirate fanatic, Wild Seas is a great title to play simply for its atmosphere and fun design. The first feature of this pokie that most fans notice is the large reel layout. The pay area is huge, being made up of a 5×4 grid. Rather than make use of large amounts of paylines that players must pay to activate, Elk have instead made use of the betways system, giving players 178 ways to form a winning combination across these giant reels. Wagers start at 0.2 but you can raise this value up to 178. There is an attractive 178 000 jackpot prize and a solid 96.3% RTP. On top of this the pokie is fully HTML 5 compatible so it works great on multiple devices. The main bonus game in Wild Seas is the Break the Convoy bonus game. When this feature kicks off, the game will randomly choose one of the rival captains to attack. When this feature starts you will see a series of ships on reel 5. As you spin these ships move one square to the left. Once they are on their way your pirate ships will appear behind them and attempt to sink them. Whenever you sink a ship it will drop treasure into the ocean which then becomes a sticky wild which remains in place until the feature ends. There are few slots that manage to capture the action packed lives of pirate on the high seas, but Wild Seas certainly lives up to its name. Elk studios have done a great job with this pokie, once again showing why they are one of the most respected names in online pokie gaming.